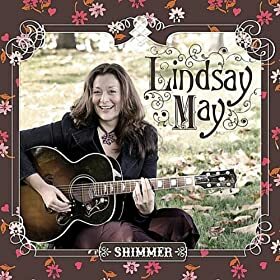 With a little bit of folk and a heaping helping of country, Lindsay May storms into your ears. Her latest release Shimmer is proof that good music with a country feel doesn't always come from Nashville. Lindsay May hails from Kelowna, BC. Shimmer is May's second album and its a thing of beauty. Ten perfect songs gathering together on one album reminding us that albums can be good from start to finish. Lindsay hits on some of the most important things that make an album great; good songwriting, a great voice, and great musicianship. With these things in place, it is no wonder that Shimmer is so good. With an album where no track can be labeled a pot boiler, it is hard to point out stand out tracks. "Spinning 45's" is a bluesy country rocker. Its a twangy song with great guitar riffs. As Lindsay sings out the names of some great classic artists, she'll have younger listeners wondering what these 45s are, that she's singing about. The rest of us, will smile and try not to feel old. This song is pure fun. The album's title track "Shimmer" is a surprisingly more pop oriented song. It is definitely radio friendly. It is easy to imagine it being played back to back with artists like Gloriana or Lady Antebellum. "Star In The Sky" is a folk song with a sweet lyric and a gentle melody. Lindsay's voice is very much her own for the most part, but on this particular song she sounds more than a little bit like Natalie Merchant. There's a little bit of a dreamer in "Nashville." The song illustrates perfectly, a singer/songwriters determination to get to the city where she could reach her dream. The opening line sets the stage as Lindsay sings, "I've got my guitar. I've written twenty songs so far. And all I can think about is Nashville." Lindsay's music has been described at alt-country. This genre as always seemed to be more like country that reflects more of what country music used to be like. There's a little bit of that sound to Lindsay's music, but she's not an artist that can easily be put in category. The first version of "Lie To You" has a hint of bluegrass to it, but an acoustic version of the song closes the album, and the two versions could not be more different. The acoustic version will definitely appeal to those that like a little less twang to their music. "Stick Around" is the bluesy-est song on the album. The melody is slow and smooth, but the guitars really wail and even whine on this one. The instruments really convey the sorrow of the lyrics. "Off in the distance, between hope and despair, there is a finish line, will you wait for me there." Perhaps its companion song is the more fun sounding "Hang Around." This girl isn't worried about the guy leaving her. In this case she's ready to settle down. She goes the acoustic blues route on "It Ain't Easy...Being Me." Its another bad relationship song, but isn't that what country music is all about? Lindsay knows how to convey that bad relationship angst well. No matter what your preference, you're likely to find a song or two to love on Shimmer. More likely than not, you'll fall in love with the whole album, because it really is that good. Lindsay May is an artist you don't want to let pass you by. She may not be a household name yet, but Shimmer may just be the album that makes her one.